The Detroit Zoological Society (DZS) recently began a new wildlife conservation project with Eurasian otters, which are classified as Endangered in Armenia and Near Threatened in the whole of their range. Their numbers have fallen dramatically in Armenia and in neighboring Azerbaijan and Iran; therefore, it is essential that we gather data on their status and work to preserve their populations. Otters are important indicators of the health of aquatic systems. They are found in a wide variety of habitats, including highland and lowland lakes, rivers, streams, marshes, swamp forests and coastal areas. Armenia, which is a small country about the size of Vermont or New Hampshire, is located in the Caucasus Mountains of west Asia between the Black and Caspian Seas. Despite its small size, Armenia is a biodiversity hotspot important for wildlife conservation because it is located at an intersection where wildlife converge from Eurasia, Africa and the Indian sub-continent. 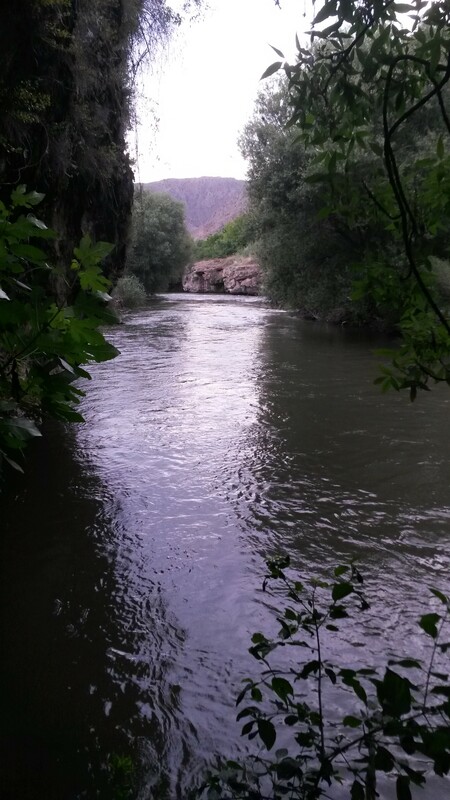 While conducting fieldwork in Armenia this summer, we walked five transects along rivers and streams in Central Armenia to look for sign of otters such as feces, tracks and/or feeding remains. In every Armenian transect, we found feces and/or feeding signs, such as crab shells, within the first 200 yards. We also set cameras along the rivers to document the otters present in those areas. We heard credible reports of otter sightings in several other areas of Central Armenia – including in urban areas – as well as in the south, west and northern parts of Armenia. It appears that otters have made a comeback, which is great news. Most otter sightings were accompanied by reports of conflict with humans, due to the otters eating fish out of the ponds at fish farms. A major component of this project – as with many wildlife conservation initiatives the DZS is involved with around the world – will be to investigate ways to mitigate this conflict. We plan to track the success of the farmers we encountered who used dogs and/or fencing as methods to protect their fishponds. We will also be surveying suitable habitats for otters in all of the Armenian watersheds. This involves overlaying a 6-mile by 6-mile grid on top of a map of Armenia and noting areas within the grid that have a confirmed otter presence. We also plan to obtain robust population estimates using genetic analyses from the otter feces. With this data, we will be able to determine important locations for otters and explore the potential of setting up sustainable protected areas. This project furthers the DZS’s mission of compassionate conservation as part of the effort is to reduce human-otter conflicts and save individual otters while establishing protected areas for otter populations to thrive in the future. – Paul Buzzard, Ph.D. is the field conservation officer for the Detroit Zoological Society.